Why shred your blue jeans?? So you can weave them into a placemat, of course! 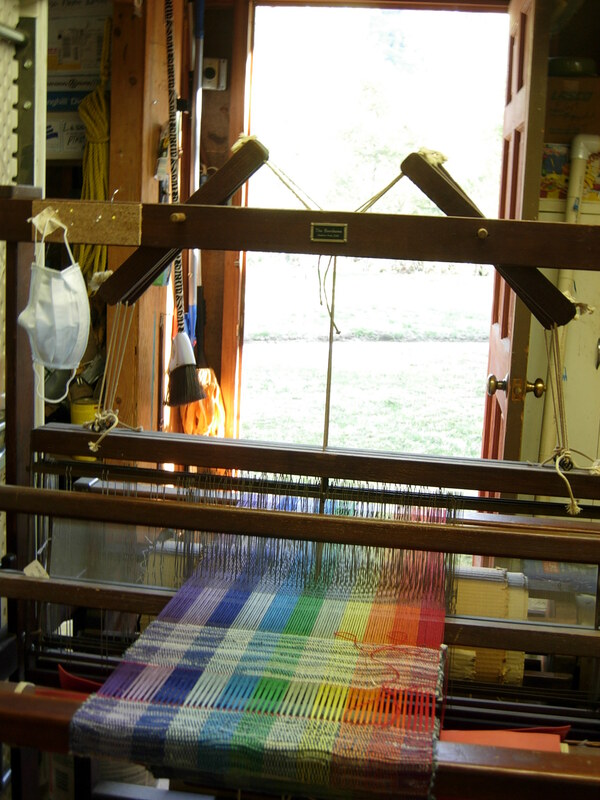 This is my loom in the garage. Blue jean strips give off a lot of lint/dust when you weave them and it’s hard to vacuum out of carpet. Therefore it’s easier to weave them in the garage. Notice the mask hanging on the loom? I wear that when I’m weaving the mats. Weaving in the garage is not all bad. Below is the view I have while I’m sitting at the loom in the garage. 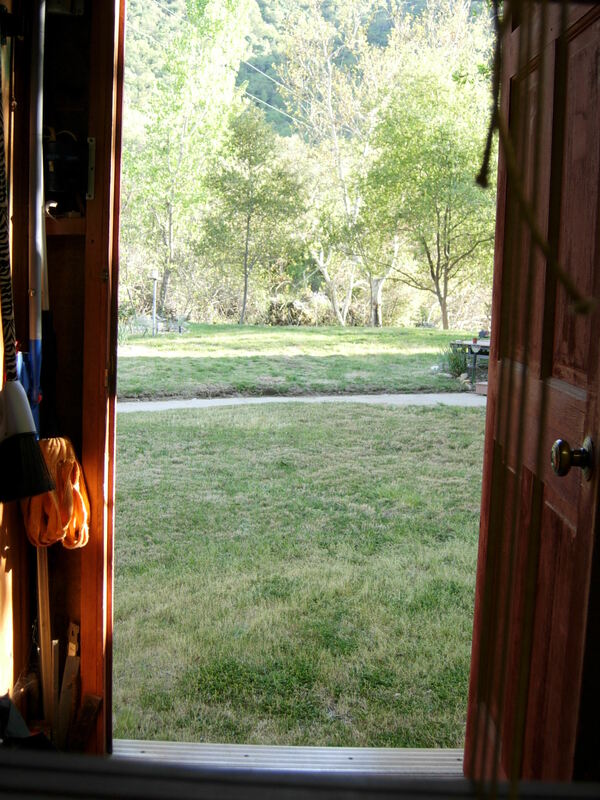 Just past the lawn is the South Fork of the Kaweah River. It makes a lovely sound. Sometimes I’m treated to a passing neighbor. There’s a bobcat who cruises through occasionally and one day she was followed by her kitten! Just 2 days ago, a cute little fox trotted by with a dead gopher dangling from her mouth. Yay! This is my “lovely assistant” (hey, if a magician can have a “lovely assistant”, why can’t I?) 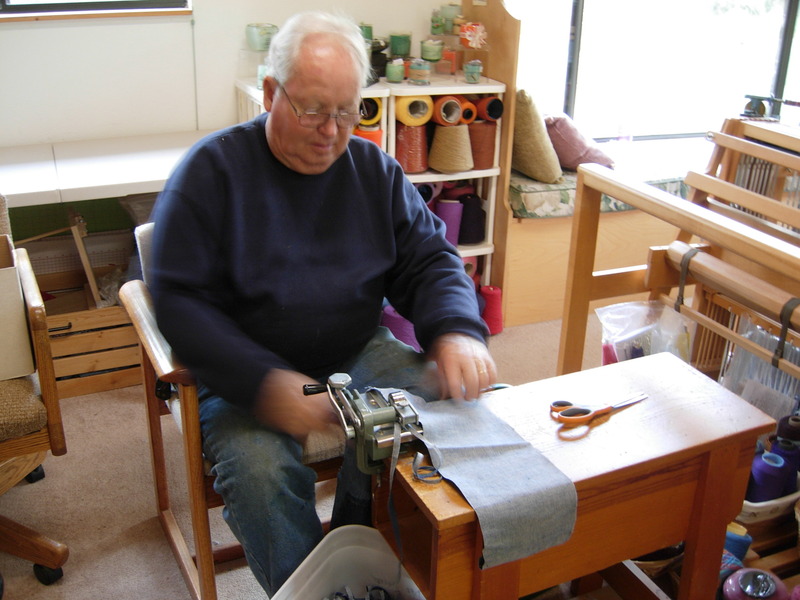 My husband, Rich is using a rag cutter to make quarter-inch strips which I will use as weft in the placemats and sometimes in mug rugs as well. By the way, he’s the one who built my beautiful studio…a good guy to have around! Do you still do the soy candles? Hi Linda, I just now discovered your message to me about candles. Yes, I do still make candles but not as often. If you are looking for something in particular, let me know. Most of the time, I sell them year round at Colors gift store in Three Rivers or at craft shows in the fall.